The cementitious composites are multi-component and multi-phase materials; thus they feature complex thermodynamics and kinetics as well as multi-scale and multi-equal characteristics according to the fundamental and the hierarchy of cementitious composites. The properties/performances of cementitious composites closely depend on their compositions and fabrication/processing as well as structures. Because the properties/performances of each scale derive from those of the next smaller scale, the nano science and technology provides a bottom-up approach for understanding and controlling the cementitious composites. 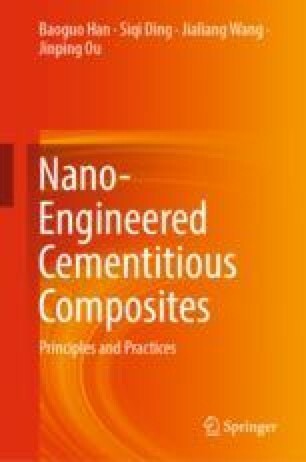 The principles of nano-engineered cementitious composites can be attributed to the nano-core effect. The behaviors of the nano-engineered cementitious composites are governed by nano-core effect zone, i.e., nano-core-shell element.